In the the past I used to use xmodmap to prevent the Caps Lock button from working, and then tell Launchy to handle the key press instead. I can't seem to do this anymore. What is the best way to disable Caps Lock's normal behavior, and make it do something else? From howtogeek.com which has a good answer for any OS. caps:none – Disables Caps Lock. caps:super – Caps Lock becomes an additional Super (aka Win key). caps:ctrl_modifier – Caps Lock becomes an additional Ctrl. Note: Xmodmap is deprecated in favor of setxkbmap. You can disable it by going to keyboard->Layouts->options->caps lock behavior and choose "disable caps lock" . I don't know why it seems inconvenient with another Keyboard keys. But Launchy works fine with me after trying it with CTRL+Super+Space. And you need to white-list launchy to the tray icons. See How do I access and enable more icons to be in the system tray?. Also you need to add it to the Start Up applications, as it won't work when it is not opened. 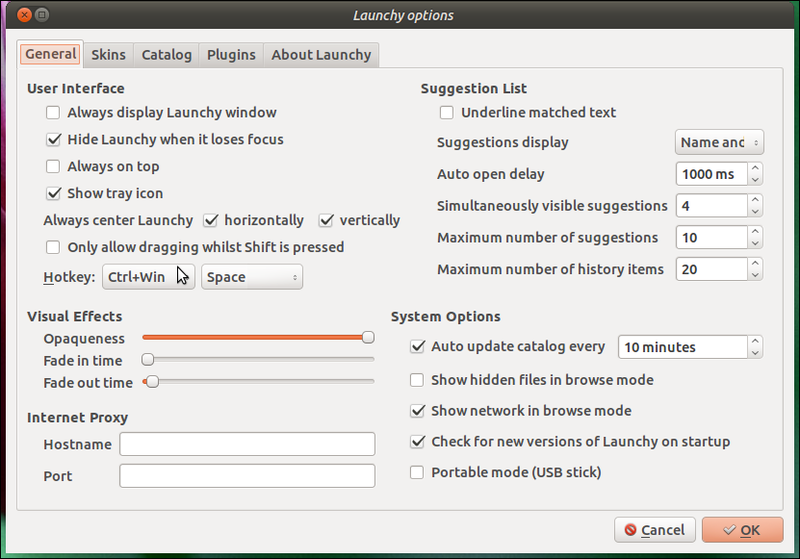 After all, As an alternative for Launcy, try Synapse for its best integration with gnome and unity. Open the Keyboard Layout application and click the "Options" button. A list of rebinding options will apear. Select "Caps Lock key behavior". Select your preferred Caps Lock repurposing option. This is basically a modification of the answer provided at https://askubuntu.com/a/223674/22073. You can also modify the behavior of Caps Lock using an XKBOption. These changes are even propogated to the virtual consoles (/dev/tty[1-6], or Ctrl-Alt-F[1-6]). xmodmap -e "keycode 66 = Shift_L"
The following method uses the combination of Compiz to launch an application when a key-press is made. change the behaviour of the Caps Lock key to mimic another key. Configure compiz to listen for the newly mimic'd key and run a custom script. create a file e.g. "capslock"
To run permanently add this command to the startup applications. Pressing Caps Lock now just mimics pressing a "cent" key - note this is not a key that actually exists on my keyboard. You can get a list of KeySym names from here. N.B. enable the key binding and use "grab key combination" to recognise your "cent" key. You cannot get compiz to recognise the cap lock key itself unfortunately. Obviously - change "firefox" for whatever command you use to start "launchy"
Now when you hit the Caps Lock key, compiz will recognise the mapped "cent" key and run the command - in this case firefox - in your case "launchy". Notice keycode (66) and keysym (0xffe5). Now, if you hit the physical caps lock button in a text box, the grave character (`) will appear. But if you map a shortcut key to it, it will do something else. If you want to be able to use it in a text box, perhaps replace caps lock with left shift, or f10, or something else that doesn't seem like it will interfere with the command you want to use. Test it to make sure the command I gave you works the way you want it to. Go to startup applications, and add that command to your startup applications. This way, the key will switch properly every time you start up. setxkbmap -option <OPTION> from Wernight's answer seemed to work immediately for me. I just upgraded from 15.10 to 16.04 and whatever I used to map this before stopped working. block in /etc/X11/xorg.conf.d/00-keyboard.conf (create if necessary). The most robust solution is to buy a keyboard that lets you remap keys in firmware, i.e. a professional, programmable keyboard. These usually cost around 200 bucks and also have high grade mechanical keyswitches. They are expensive, but they are the only way to avoid having to fight with this at every new machine you sit down at, and each time the developers make breaking changes to OS infrastructure as fundamental as the keyboard map. Not the answer you're looking for? Browse other questions tagged xorg keyboard shortcut-keys or ask your own question. 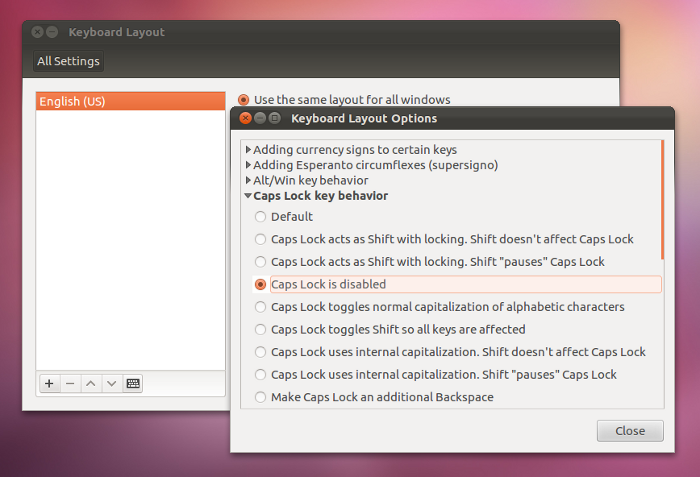 How do you remap a key to the Caps Lock key in Xubuntu? How do I swap Escape and Caps Lock in 14.04? Remaped the Tab key to the CAPS LOCK key but CAPS LOCKS still turning on and off?